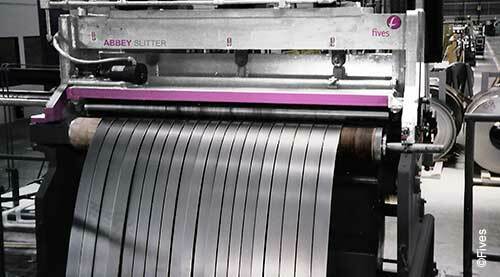 Fives builds a wide range of Abbey slitting lines for low carbon and stainless steels. The largest will slit coils up to 45 metric tons and 2,790 mm wide. These lines include automatic edge control, injector or lift-off slitting heads, scrap winders or choppers, tension stands, and many other features. The 1,525 mm (60”) slitting line is made specifically for bright finished, stainless steel strip. It features precision slitting with quick change heads and tension stand with non-marking materials throughout. This Abbey slitter is an injector head, quick change slitting system used for high production slitting of carbon steel for the tube market. It is one of several quick change methods we offer, from simple lift-off to powered injector-head style. Our largest Abbey Slitting Line handles high strength steel coils to 2,790 mm (110”) and 45,300 kg (100,000 lbs.). Three coils are stored while one is being processed. A coil car moves the coils to the uncoiler. Dual uncoiler heads are used with hold down, stripper, and automatic edge control. With features on this line, no man-handling of the strip is required, resulting in high productivity. This line has four speed ranges to 180 mpm (600 fpm). This slitter has a tension stand with pit tables for light gages, powered pre-bending, and powered positioning of mults for easy threading into the recoiler gripper.